Made of break and chip resistant genuine stoneware. These ranch friendly dishes travel easily between the freezer, microwave and dishwasher. Imported. This hand crafted 16 pc western dinnerware set is available with vintage rust decorator accents. 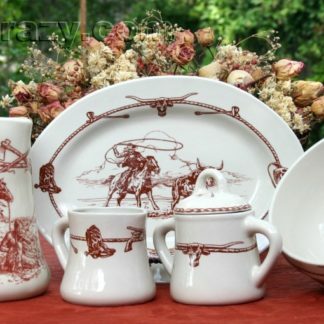 You can also add to this western dinnerware set by ordering our Sky Ranch Dinnerware page for open stock pieces and matching serving sets.